Travel with Kevin and Ruth! 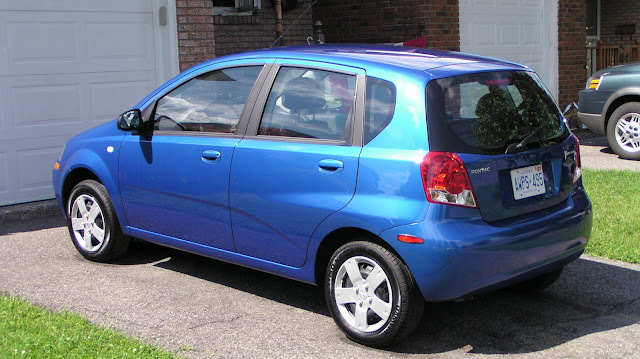 : The little blue car is 10 years old today! I was driving a lot of miles in this job, and I wanted somthing that was fuel efficient. But I also wanted cruise control and a standard transmission. And I did not want air conditioning. It was a bit of an oddball package, but I was able to get what I wanted by ordering the upgrade package that included cruise control and power windows...but with no air conditioning. I was trying to find the original bill of sale . I know we've got it somewhere but it might be back in Ottawa in Ruth's dad's basement. I think the total came to something like $13,500. I think I remember the payments were around $300 a month for 48 months. The only brand new car we've ever bought. Yes, this is the only brand new car that we've ever bought. And we'll probably never buy another one! In fact, I still can't see why we would ever have to buy another car period. At ten years old, the little blue car has 208,000 kms (129,000 miles) on the odometer. He's only just broken in! And, he doesn't look much different than he did in those pictures above. Still has completely original paint, and there isn't a spot of rust anywhere. But despite all of that, he's not worth very much money today. I bet we couldn't get $2,500 for him. And he's worth a lot more than that to us, so we'll just keep him for the foreseeable future. As it stands, we have no need for anything more and he's doing just fine as our run around vehicle while we're here at the park during th summers. He's been on a lot of adventures with us over the years. Here's the little blue car in Oaxaca, Mexico. And at White Sands National Monument in New Mexico. And in February of 2013, we drove him all the way into Guatemala. There aren't many cars in North America that can say they've been in five different countries! The little blue car was actually built in South Korea. So, he's been in South Korea, Canada, United States, Mexico, and Guatemala. Wow! He's been a great little car and I bet there are still more adventures in his future. We are proof that we have no idea what the next ten years might bring, but he owes us nothing and we plan on keeping him as long as we can. A lot of RV'ers use the "Instant Pot" pressure cooker, and I see that it's on deal of the day today at Amazon. If you've always wanted one, today is the day to buy it! We tried that back in 2013 and it didn't go well, ended up deciding that Little Blue Car was his name. We hate acronyms so it will never be LBC! I remember years ago you were seeking names for the little blue car. I suggested that you just keep calling him "the little blue car" and I guess others did too. Since it was made in Korea, I bet it is really not a GM car, but an import of Korean heritage. Do you know? No it doesn't look like it was an original GM. This is what Wikipedia says about it. 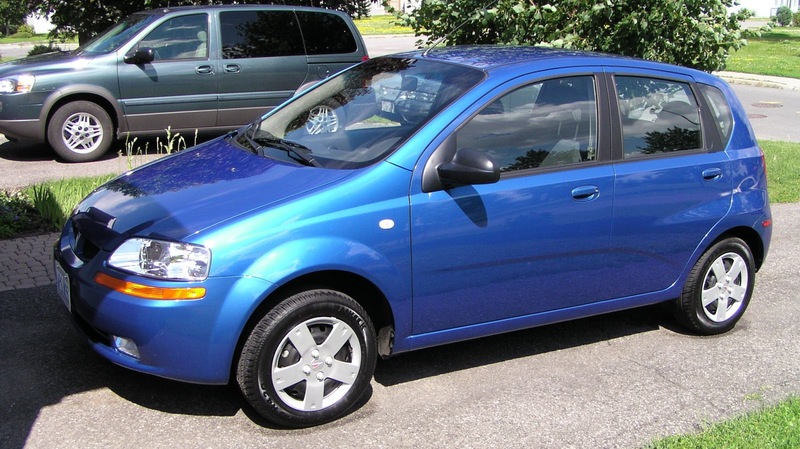 "The Daewoo Kalos was introduced in 2002, based on a then-new Daewoo platform named T200, replacing the Daewoo Lanos (T100). Under development before Daewoo's bankruptcy, the Kalos was the company's first new model introduction following its subsequent takeover by General Motors. Manufacture of the Kalos began in early March 2002, with pre-production prototypes shown at the Geneva Auto Show in April 2002. The nameplate Kalos derives from the Greek word καλός (kalós) for "beautiful" and "good"." We have a 2000 Pontiac Grand Am with 208,000 miles on it. Kevin worked for a dealer at the time so we also got a great deal on it. Hoping it last many more miles. Of course much of the key is vigilant maintenance. I remember you mentioning about your car at the beginning of the spring season when you got it back out of storage. Yep, maintenance is the key to a vehicle lasting so long! We had to part with our very excellent 2007 Toyota Camry Hybrid when we decided to go full-time traveling and living in a motorhome. The Camry was not towable 4-down. It was "my" car and I was truly heart-broken. It drove great, had an excellent sound system and some nice interior features, and got great gas mileage. It never gave me one lick of trouble, and even withstood the ridicule and stupid recalls that Toyota foisted on it through its troubled times of litigation. Fortunately, we were able to bless a young couple who were graduating seminary and about to plant a new church in Michigan's UP, by selling the Camry to them at a sweet price. It astounded me that the car's book-value was so low. As you said, it was worth so much more to me/us. Moving on - now we have an '07 Jeep Liberty as our toad, and I'm trying to love it. I'm glad you've decided to keep on lovin your LBC. He's a keeper. It's amazing how attached you can become to a car - I was sad when I had to give up my 18-year-old Honda Civic hatchback. When a car is looked after so well, it is hard to give it up, especially when you know how reliable it has been and you have to then get something "new" and the new car could have a lemon. He is definitely a keeper. Just keep up the maintenance and oil changes and this car will give you 400000 km. No problem. I've only had one new car and that was back in 1983. I hate making payments of any kind unless, like in your case, it was 0% interest and we were still making money in the bank. The car will last for many more years to come. Kevin had always said we would never get a new car but then this deal came up and how could we refuse. The Little Blue Car owes us nothing. It has been such a good reliable car and we have been super happy with it. Mind you, it helps that he doesn't get driven in the winter. Your little blue car is a mere baby! A little white 1994 Acura Integra coupe became mine on September 14th, 1993, so it will soon turn twenty-three. I love my little car too, but the older I get, the harder it is to get in and out of! Its mileage is only 121, 000, but that's because it hibernates in the garage all winter while we enjoy Florida's warmth. Up against your car, he does seem like a baby but he is hoping to make it to that age or better. The mileage of the Little Blue Car won't be going up fast anymore either, he spends his winters hibernating in a garage as well. Most of his driving was done in his first few years of life. How cool that you remembered LBC's birthday! My Dodge pickup turns 20 next May, and I am currently investigating the exact date, so I too can have the cake ready. It is actually the date that we first bought him and sat him in our driveway, not the actual date he was manufactured. Kevin believes that was in February of the same year. Sounds like your truck is doing well too! Maintenance is the trick, our 2002 Saturn has 220,000 kms driven, another 200,000 towed. Worth much more to us than sold, same with our coach. Yep, maintenance is definitely the trick!